We’d love your help. 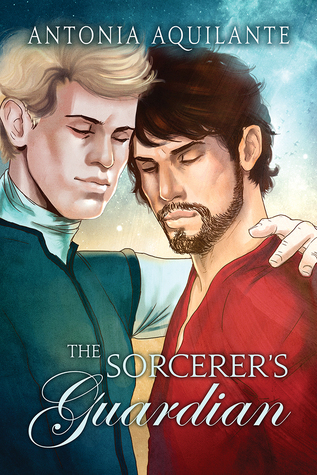 Let us know what’s wrong with this preview of The Sorcerer's Guardian by Antonia Aquilante. Savarin, the most powerful sorcerer in Tournai, has honed his Talent through years of study and made magic his life. Among the wealthy and noble circles he moves in, no one would suspect the handsome, refined, and arrogant sorcerer’s humble beginnings, which is how Savarin prefers it. Tournai’s princes task Savarin with studying and strengthening the spells that protect th Savarin, the most powerful sorcerer in Tournai, has honed his Talent through years of study and made magic his life. Among the wealthy and noble circles he moves in, no one would suspect the handsome, refined, and arrogant sorcerer’s humble beginnings, which is how Savarin prefers it. Tournai’s princes task Savarin with studying and strengthening the spells that protect the principality from magical attack. They are complex, centuries old, and exactly the type of puzzle Savarin is eager to solve. To his annoyance, the princes insist Loriot accompanies him. To ask other readers questions about The Sorcerer's Guardian, please sign up. This is the fourth book in the ‘Chronicles of Tournai’ series, set in a fantasy world where almost everyone has some level of magical Talent and the royal family has a whole lot but keep it a secret. After the excitement of the mighty empire of Ardunn attempting to overpower the much smaller but resilient country of Tournai in the previous book, the storyline focuses on the mysterious defenses that have protected Tournai so far, but seem to be weakening. None other than Savarin, the powerful sor This is the fourth book in the ‘Chronicles of Tournai’ series, set in a fantasy world where almost everyone has some level of magical Talent and the royal family has a whole lot but keep it a secret. After the excitement of the mighty empire of Ardunn attempting to overpower the much smaller but resilient country of Tournai in the previous book, the storyline focuses on the mysterious defenses that have protected Tournai so far, but seem to be weakening. None other than Savarin, the powerful sorcerer who discovered the problem, is now tasked with fixing it- except he doesn’t even know what spell was used or why it has lasted so many centuries already. Needless to say, I’ve been on pins and needles ever since all of these issues were revealed at the end of book three. And yes, I think you should read this series in order because you’ll be missing not just lots of background information needed to understand what’s going on, but you’d also deprive yourself of some very entertaining and suspenseful stories with great characters. Savarin is a very powerful sorcerer, and I was curious to find out more about him. He has occasionally appeared in previous stories and always seemed very withdrawn, intensely private, and arrogant. Not that any of that changes – he is still arrogant and tends to get lost in his work, much like most “professor types” I have come across. But it becomes apparent why he is that way as some of his background is revealed, and he definitely turns more human through his increased contact with Royal Guard Captain Loriot. Savarin’s basic personality doesn’t change, but he becomes a little softer around the edges, allows himself to relax more. While figuring out the protection spell and what makes them tick is by no means easy, Savarin can’t resist a good puzzle like that. Savarin and Loriot are not an easy match. They don’t exactly hate each other, but they think they have nothing in common. Pure coincidence leads to their first physical encounter, and it is surprisingly enjoyable – which is all they will admit to. Both try to be ridiculously “logical” about their affair. They’re passionate and almost without control while making love, but as soon as they leave the bedchamber, their responsibilities become more important than the feelings they won’t admit they have – not even to themselves. Once they have returned from their trip, it takes Savarin’s surprise encounter with the son he didn’t know Loriot has for them to realize they don’t want the “affair” to end. Rather, they want more... except it takes them quite a while to figure out how to go about it. If you like fantasy that includes magic, shifters, and men dedicated to their jobs to the exclusion of almost everything else, if you want to find out more about the secrets of Tournai, and if you’re looking for a read full of action, adventure, great feats of magic, and a slow-burn romance that might have you wanting to tear your hair out because the characters don’t seem to get it, then you will probably like this novel as much as I did. It’s fantastic, surprising, and very entertaining! ARC provided by Dreamspinner Press in exchange for an honest review. This book was a struggle. I almost didn’t finish it multiple times. First of all it was a bit boring. I ended up skimming some while Savarin and Loriot were traveling inspecting the borders. The other problem was Savarin. He was just so unlikable. He was such a tedious and arrogant self-centered individual that I just couldn’t warm up to him. Even at the end when he supposedly opened up more to Loriot, I didn’t like him. And I just didn’t find the romance between Loriot and Savarin believable. The best parts of the book involved Loriot’s son and the parts dealing with the princes. This is definitely my least favorite of the series and frankly I’m not sure I want to read any more installments. Especially if they don’t deal much with the royal family. When I knew I'd be reviewing this book, I grabbed up my paperback copies of the first three in the series (yes, I have the paperbacks – they're just that good!) and dived right back into the fascinating and amazing world of The Chronicles of Tournai. I'd barely forgotten anything since reading them at the beginning of the year, but I wanted to make sure that all the little details were still fresh in my mind, especially since Savarin – our MC here – was just a minor character previously. Boy am I glad that I did. As before, this is a top notch, 5 star read. Not only does the series not have a formula that gets boring, because each book has a unique take in a world I'm already familiar with, but it plucks these minor characters out of the background and lets us get to know them in a way that absolutely makes sense. Quite honestly, I'd love to see more. I want stories for Griffin, Bastian, Jadis and Corentin. By then, maybe little Julien and Alain will be old enough for their stories, too. I could quite happily have this series go on and on and on so that it never ended. And I bet that, then as of now, they'd all be 5 star reads. Once again, we got the dual POV storytelling that let us get to know Savarin and Loriot better, without ever feeling like we were left out. The fact that we also got to read Philip and Amory's POV's was great, because I love that they're this little thread of connection through the entire series. Another thread is that there's an overarcing storyline – from Philip being King and all that entails, to little Julien growing up, even to the threat from Ardunnian spies – there's always some little thing that brings all the stories together and makes them really connect as a series. After reading this one, I'm now really curious about Julien's reaction to the strengthening of the spells and Alain's reaction to water. I find them really intriguing and only hope that means they'll be picked up on in the next book or maybe even the one after that. And that's what is so good about this series. Though there are tiny little things that seem insignificant at the time, that you wonder about and that go unexplained or seem like a fluke, really they're quite important. And, at the heart of it all, each book is it's own individual novel and plot. All the important questions are answered, all the important characters play their part and so on. Not one of these books has ever felt incomplete. When it came to the characters, I really wanted to read Savarin and Loriot's stories, especially as I was re-reading books 1-3 in preparation for reading this. It just never occurred to me that they could end up together! And it absolutely worked. The banter they had, at the beginning, when they pretty much disliked each other but were reluctantly attracted to each other, was fantastic. It really set the pace and the excitement factor for the rest of the novel. That first kiss! Holy cow! That was scorching hot and it was just a little more of what was already some pretty serious chemistry, even when they disliked each other. That storm that brought them together really was the epitome of their entire relationship – calm moments, hot and heavy flashes and some real intensity that rocked the foundations. The way they were with each other for the first half of the book was really a really nice two-way affair. They both went in with their eyes open, knowing what to expect and how long it would last, which wasn't long. It's unlike the way Etan and Tristan were with each other, when they began their affair, and I loved that subtle comparison. There were a few dicey moments, when I really wondered what was going to happen, how things were going to pan out and if this might be the first that spread the overall plot over into a second novel, but it all worked out so fantastically in the end. I loved that Savarin got to be his bullish, feisty, argumentative self with Philip (and everyone else). But I also really loved that he and Loriot had this careful knowing, this calm understanding between them that slowly blossomed into more. The way they made a clear attempt to adjust to each other, to accept and include each other, even when it was difficult, was just beautiful. Little Alain and Prince Julien were surprisingly brilliant side characters in this novel. I've always loved Julien, since he first came along, but the addition of Alain was a perfect exciteable balance for the calm Prince. I'm intrigued to see them become friends and how that will fare. The second time Savarin made that toy horse run I was almost in tears. I can't tell you more than that, because it was such a moment. But trust me when I say that it really affected me. There were a lot of moments, a lot of conversations and small incidents that had me near to tears or laughing out loud or just swooning over this sweet couple, but I can't tell you about them. I refuse to ruin it with spoilers. You'll just have to read it. Overall, this was one more book in the series that I became totally and completely immersed in. I was captivated right from the start. Ok, let me first say that I've read all of the books so far in the Tournai series and I'm done with them. I just can't read any more. In general, the pace is slow-to-boring, the action occurs off-page, the cover art is dreadful, and I lack connection to the characters. But the setting is wonderful, if the characters a little too 2-D and stagnant. I mean, I get the impression that the author really doesn't know what her characters do for a living. There's talk of "meetings" and "estate business" Ok, let me first say that I've read all of the books so far in the Tournai series and I'm done with them. I just can't read any more. In general, the pace is slow-to-boring, the action occurs off-page, the cover art is dreadful, and I lack connection to the characters. But the setting is wonderful, if the characters a little too 2-D and stagnant. I mean, I get the impression that the author really doesn't know what her characters do for a living. There's talk of "meetings" and "estate business" and "studies," but what do they DO? Anyway, it's as annoying as the description of every character as a rich, handsome man who has mysterious business off-page. But all that said, I tripped into reading "The Sorcerer's Guardian" first of all the books and I really really enjoyed it. Slow, omg so slow that I often checked the page count because really, how was the plot never moving forward? lol. But Loriot is an amazingly deep character (for this author) and unlike all of the other MC-combos in the other books, these two have some definite chemistry. And I enjoyed how Savarin's character evolves throughout the book. The world-building is better here than the other books as well, and the involvement of the the MCs from the previous books actually makes sense to the plot. The magic-working toward the end is weak but the result still managed to surprise me. While I feel that 5 stars is generous, this one stands out from the rest. 1) A perfect score from me for this elegantly written tale of wizardry and enduring love. Savarin is a master wizard, Loriot, the captain of the royal guard - an unlikely and reluctant pairing when Lorriot is directed to guard Savarin on his quest to shore up the magical defenses of Tournai. At first irritated by the wizard's seeming arrogance, Loriot grows to admire Savarin's strength of character and bravery. Their relationship is beautifully written, slow to start then a tumult of passion and desire that heated up the pages to a delicious degree. I loved this story and recommend it to anyone who likes well-crafted tales of alternate worlds and magic. 2) The Sorcerer's Guardian was a touching, well-written, and absolutely solid fantasy. I settled into it easily, immersing myself in a believable world filled with complex characters, both main and supporting. I appreciated the internal struggles that the main characters went through to build their relationship, and that the plot was not dominated by a world-ending threat or violent conflict. I'd definitely recommend the Sorcerer's guardian to anyone who wants a good, and feel good, fantasy story. A must read in the Tournai series! A beautiful love story! Mild Disclaimer before I begin this review, I am totally biased to this series and am in love with it. Okay? Let’s go then. This was different as the first three books each had a member of the royal family in it and in this, we have two men who are charged and trusted with not only the protection of the royal family but their secrets as well. It makes sense that Savarin and Loroit would be perfect for one another for who could handle the men who hold such power in Tournai. The men are thrown together by order of Prince Philip and they know they must obey. Savarin is to make sure Tournai stays safe via his talent and Loroit to make sure Savarin remains safe... Period. Neither man is happy about it but their banter at the beginning of the journey was fun to experience. Underneath the banter is the building chemistry and a low level of UST that leads us to one hell of a first kiss *fans self* I knew the second these two gave in it would be electric but that scene and the setting was stunning. This book was a reminder and a lesson in the slow burn of romance. *whistles* This story took on the practice of patience right along with Loroit as he waited and watched Savarin perform his magic. The romance was lovely and so respectful of their responsibilities to their positions and to the lives they lead back in Jumelle. When we do return home with the captain and the sorcerer we begin to see how much their affair means to the men and how they will begin to let their guards down and allow this relationship to blossom. Loroit learning to really trust magic comes with him learning to trust Savarin and Savarin learns that his talent does not have to be his whole life and that letting others in, thinking of their safety, their wants and love only make his talent strong. Both men have lessons of their lives, their loves and their loyalty to learn in this book and it was beautiful to witness. It was so great to see the men from the first books in the stories and as always it was great to get the POVs of Phillip and Amory again. But I have to confess seeing Etan, Cathal and Phillip all use their talent made me giddy even though it was for something serious and possibly dangerous. The talent the royal family possess, the Tournai legend always makes me smile for how the men are when the use it. As Lord Flavin once said, they are Shameless (*ahem* Cathal) and it’s adorable. The other side characters as well as Julien and now Alain were so delightful and yet each time Savarin had moments with Alain I hugged my Nook… but the last time with the horse, just brought me to happy tears. Goodness. This was just so good. This world, this land of Tournai and all it includes always draws me in and let's me get lost. Knowing bits of Savarin and Captain Loroit was helpful, but honestly it didn't take away from the romance of this couple. Two strong and powerful men learning to trust and love was breathtaking and I couldn't get enough. The softer sides to Savarin were swoon worthy and the fierce loyal of Loroit was gorgeous. They make this amazing couple and all that they give to one another made this hopeless romantic so stupidly happy. I won't go into too much as there is a lot to learn with the series and yet still more I have questions about. The author does a wonderful job of weaving the storyline throughout each book yet making each one is own story as well. It's this continuously flowing story arc that I will never get tired of reading. Another MM book with bisexual main characters! Just like the second book in the series, and let's not forget about the third book which actually starts out with a main character marrying a woman. I didn't read the first book in the series but I can only imagine the numerous heterosexual relationships those characters will have to 'overcome' to be together. Looking forward to the next book! Maybe Jadis will get his story?